Do a quick Google search for “website designer Charlotte,” or “Charlotte website design firm,” and you’re sure to see more results than you can handle. But not all web designers are created equal, and unfortunately, you don’t always get what you pay for. Finding a good web development partner is like finding a good mechanic – it’s a difficult process, but once you find a proven design team you trust, you’ll never go anywhere else. QC Marketing has been a Charlotte website design firm since the early days of the web. We’ve managed web design in Charlotte for a wide-range of companies and offer businesses access to some of the best website designers in Charlotte. 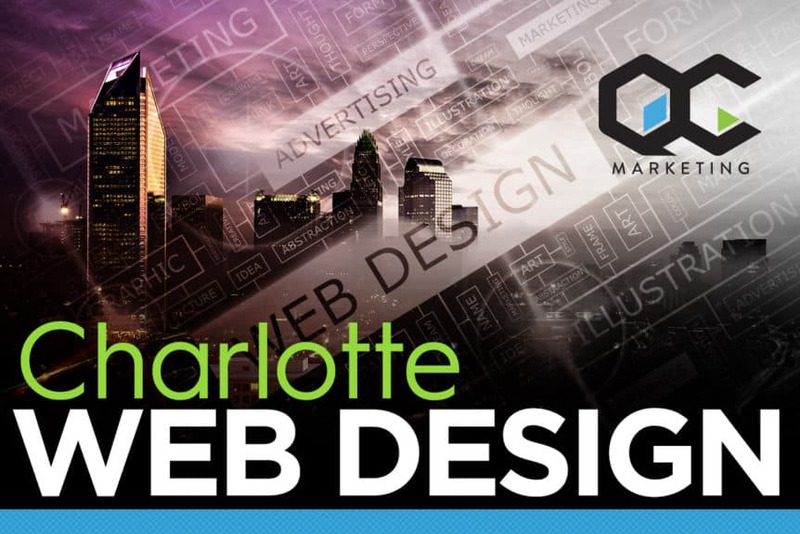 There are plenty of Charlotte website marketing companies that offer web design, but few have the experience or skills to match all the working parts QC Marketing offers. Our commitment to providing our clients with the best web development practices and complete business solutions is hard to match. There are tons of so called “experts” that really don’t know what they’re doing. Making the mistake of working with an unqualified freelancer or unproven business can cause more harm than good. That’s why it’s important to know how to properly vet a Charlotte web design firm. A business should know what to ask and at least a little about the process; this way, you can make sure your web design project is being handled properly. Not every business understands the process of web design, and sometimes web designers can take advantage. When starting a relationship with a Charlotte website design firm, or website designer in Charlotte, know that you should always be provided with a free consultation or quote. If you’re ever asked to pay for the designer to evaluate your website, provide a consultation or offer an accurate quote, feel free to end the conversation right there on the spot. Free consultations and quotes are the industry norm, and any website designer operating differently should be a major red flag. Some Charlotte website marketing and web design firms charge monthly fees for managing your website. This practice, while common, isn’t mandatory, and is a tricky way to keep you paying, even when they’re not working. Website design work often involves projects; not necessarily ongoing support, maintenance or changes. Your business or website may need some web design work done now, but once this project is complete, there’s little need to keep paying; until there’s more work to be done. If you’re speaking with a Charlotte website design firm and they bring up monthly fees, make sure to ask them what the fees include. What other work will they do, even if no web design work is needed? Are you simply paying them a retainer, or will they continue making improvements, every month? If you don’t get a reasonable answer, or aren’t satisfied with the answer given, go ahead and end the discussion. While some website designers in Charlotte charge monthly fees, make sure you know exactly what you’re paying for. In general, don’t accept monthly fees; instead find a Charlotte website marketing and design company that doesn’t ask you to pay simply to maintain an already properly functioning website. Will Web Copy Be Optimized for SEO? A big factor in good web design is well written copy. It’s important that this copy be optimized for SEO; otherwise it’ll be difficult to be found online. A good Charlotte web design firm will understand local SEO, copywriting and keyword research. All of words on your business’ website should be used with purpose, and help appeal to visitors and search engines equally. Without proper keyword research, implementation and placement, a website may look good, but serve no functional purpose (if it can’t be found). When talking with a web design team in Charlotte, ask them about their SEO techniques, strategies and previous successes. Find out what they know about local SEO, especially in the Charlotte area, and ask them how they’ll implement their knowledge on your website. If they clearly don’t know SEO, or have no intention of using it while designing your website, take that as your cue to look elsewhere. Analytics is an essential part of every website. With proper analytics, a business knows exactly what’s happening on its website, such as the amount of visitors, where they came from, how they engaged with each page, what they clicked, what other pages they visited, how long they stayed on each page and what was the last page they visited. In addition to the metrics listed above, analytics tools also provide audience demographics, including interests, location, referral source and more. All of this information combines to create an excellent source of knowledge about who visits and how they used your website. Ask the Charlotte website design firm you’re speaking with if they install analytics on the website before it’s finished. If they do not, or worse, don’t know how, go in another direction. This is a vital part of all websites and is a mandatory step for any good web designer in Charlotte. How Will CTAs and Branding Be Included? While a website is a great informational tool, for businesses it’s also about converting site visitors into customers and leads. To do this, a website should always include strategic CTAs (calls-to-action), engagement features and consistent branding. Ask prospective Charlotte website marketing and design firms how they’ll include all of these within the site. What techniques will they use to encourage engagement, generate leads and promote the brand? Will CTAs be clear, specific and lead to action? What type of engagement features, content or tools will be used, and how will they function? How will the business’ brand be promoted, reinforced and clearly defined. Expect good answers to all of these questions, along with clear strategies. When vetting a Charlotte web design firm, make sure all of these efforts will be included on the website, and expect nothing less. Now that you know how to properly vet a Charlotte web design firm, put us to the test. Get in touch to set up your 100% free consultation. We will never charge you for a quote and don’t require monthly fees. Besides being one of the top web design firms in Charlotte, we’re also expert local SEO strategists; we’ll optimize all of the content on your website for SEO and make sure your site will be found online. Before any web design is complete, we’ll install analytics, to help you track performance. And of course, all of our website designs include strong CTAs, engagement features and consistent branding.